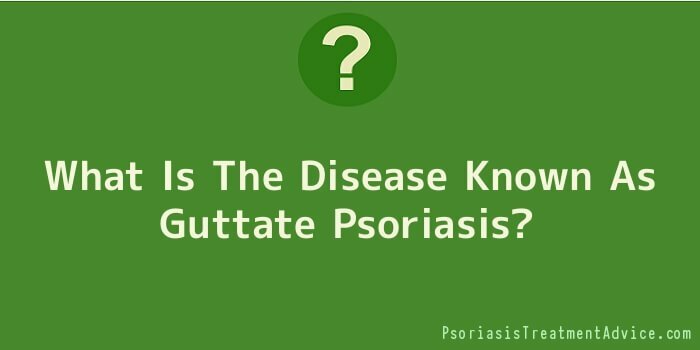 What Is The Disease Known As Guttate Psoriasis? The skin disease that is called guttate psoriasis is actually a type of psoriasis that affects only a small fraction of psoriasis sufferers. Guttate psoriasis is just one of the distinct types of psoriasis, and it is characterized by the small drop-like lesions that a person gets on his skin. When a person is infected with guttate psoriasis, he will basically have these lesions all over his body, and these may eventually develop white or silvery scales. A person can get guttate psoriasis due to a few possible factors. One of the causes cited as a possible reason for the development of guttate psoriasis in a person is strep throat. This illness may trigger the occurrence of this kind of psoriasis, and it often happens without any prior indication that the person will be getting it. When a person suffers from strep throat, this type of psoriasis is likely to emerge, and while strep throat can be easily cured, guttate psoriasis will stay with the person for the rest of his life. This disease cannot be cured, but it can be kept to a minimum or controlled with continuous treatments. This kind of psoriasis is one of the rarest of the psoriasis types, and while unsightly to look at, it is actually not contagious. People who are unlucky enough to get inflicted by this rare form of psoriasis may suffer some mild discomfort in the form of itchiness. Flakes may also appear over these teardrop shaped lesions if treatment is not used for it, and they may continue to increase in number and frequency unless something is done to help control them. The treatments that can be used to help keep guttate psoriasis at bay include the usual treatments that most psoriasis sufferers use. There are topical treatments, oral treatments and even light therapy. Exposure to the sun without getting sunburn is also one of the known ways for a person to get some relief from guttate psoriasis, and it is also an effective way to keep the disease from spreading and propagating. When a person suffers from this kind of psoriasis, he will need to consult with a doctor who knows what is needed to help the patient return to a normal life. Since this disease can strike without warning, oftentimes, before a person reaches the age of 30, and stays with this for the entire duration of his life, treatments are needed to help that person cope with lifelong itchiness and flakes, and possible skin infections if the problem is left untreated.